An apple a day keeps the doctor, well, from performing triple by-pass surgery because your plumbing is so gummed up; you're going to keel over any second! Every day around 3pm, my mid-afternoon snack consists of an apple; you could set your clock by it. Just about everybody at the office has made a comment about this at one time or another, but if anybody looks upon my dietary habit with a bit of a smirk, they may now be laughing out of the other side of their face. A recently presented scientific paper is offering more proof that my daily nibble is a contributing factor to good health. Experimental Biology is an annual scientific meeting which brings together nearly 13,000 scientists from various academic institutions as well as government agencies, non-profit organizations and private corporations. On April 12, the University of Florida presented a study showing that the age old adage "an apple a day keeps the doctor away" is more than just a saying. It has been known for some time that the apple has benefits beyond just fibre content. Studies on animals have demonstrated "pectin and polyphenols in the fruit improve lipid metabolism and lower the production of pro-inflammatory molecules." I have no idea what that means, but it sounds good. Dr. Bahram H. Arjmandi, PhD, RD, has conducted research on 160 women ages 45-65 dividing them into two groups, one eating dried apples daily and the other eating dried prunes. Arjmandi reported that within 6 months, those eating apples experienced a 23% decrease in LDL cholesterol or "bad cholesterol" while increasing HDL cholesterol or "good cholesterol" by 4%. Even though an apple represented an extra 240 calories per day, the subjects did not gain weight; they lost on average 3.3 lbs (1.5 kg). The researcher said that reducing body weight is an added health benefit explaining that this may be due to the fruit's pectin which is known to have a satiety effect. We eat an apple and we no longer feel hungry. Is eating an apple good for the soul? It can now be proven that it is certainly good for the heart. Changes in cholesterol levels, reduced weight, two factors which reduce heart risk factors. WebMD Health News in their article "Apples Good for Your Heart" (April 12/2011) which discusses Dr. Bahram H. Arjmandi's study, adds: Apples are rich in pectin, a soluble fiber, which blocks cholesterol absorption in the gut and encourages the body to use, rather than store, the waxy stuff. Apple peels are also packed with polyphenols -- antioxidants that prevent cellular damage from free radicals. As per figures from StatsCan released on November 30, 2010, its 2007 figures on the Leading Causes of Death, there were 235,217 deaths in Canada in 2007 with 51% of those deaths attributed to cancer and heart disease. Cancer was ranked as the number one cause of death at 30% with heart disease as number two at 22%. A comparison between Canada and the U.S. shows a reversal. In Canada cancer is first and heart disease second while in the U.S. heart disease is first and cancer is second. 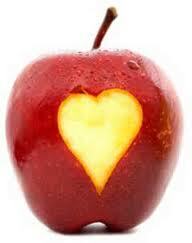 Whatever the case, heart disease is up there and would a little bitty apple hurt you? According to the Phrase Finder, this saying has been with us in one form or another for several centuries possibly originating from Wales. The February 1866 edition of Notes and Queries magazine includes this: "A Pembrokeshire proverb. Eat an apple on going to bed, And you'll keep the doctor from earning his bread." A number of variants of the rhyme were in circulation around the turn of the 20th century. In 1913, Elizabeth Wright recorded a Devonian dialect version and also first known record of the version we use now, in Rustic Speech and Folk-lore: "Ait a happle avore gwain to bed, An' you'll make the doctor beg his bread; or as the more popular version runs: An apple a day Keeps the doctor away." In Western Christian art, the fruit of the tree is commonly depicted as the apple, which originated in central Asia. This depiction may have originated as a Latin pun: by eating the malum (apple), Eve contracted mālum (evil). Isn't it curious? Apples are used all over the place to represent the forbidden fruit and yet I don't think I've ever heard anybody claiming that the Bible says eating an apple is bad. Years ago, my father told me he was occasionally having some pains in his chest so I convinced him to go see his doctor and have some tests done. He ended up having triple by-pass surgery and afterwards, he told me that he would never again take my advice. We had a good laugh together about that. Nevertheless, I hope with a few good habits, I can avoid the same fate. Health truly is everything. Experimental Bilology 2011: April 9 - 13, Walter E. Washington Center, Washington, D.C. This multidisciplinary, scientific meeting features plenary and award lectures, pre-meeting workshops, oral and posters sessions, on-site career services and exhibits of an array of equipment, supplies and publications required for research labs and experimental study. Experimental Biology is an annual meeting comprising of nearly 13,000 scientists and exhibitors representing six sponsoring societies and 16 guest societies. General fields of study include anatomy, pathology, biochemistry, molecular biology, investigative pathology, nutrition, pharmacology and immunology. EB 2011 is open to all members of the sponsoring and guest societies and nonmembers with interest in research and life sciences. The majority of scientists represent university and academic institutions as well as government agencies, non-profit organizations and private corporations. The proverb "An apple a day keeps the doctor away. ", addressing the health effects of the fruit, dates from the 19th century Wales. Research suggests that apples may reduce the risk of colon cancer, prostate cancer and lung cancer. Compared to many other fruits and vegetables, apples contain relatively low amounts of vitamin C, but are a rich source of other antioxidant compounds. The fiber content, while less than in most other fruits, helps regulate bowel movements and may thus reduce the risk of colon cancer. They may also help with heart disease, weight loss, and controlling cholesterol. The fiber contained in apples reduces cholesterol by preventing reabsorption, and (like most fruits and vegetables) they are bulky for their caloric content. Apple juice concentrate has been found to increase the production of the neurotransmitter acetylcholine in mice, providing a potential mechanism for the "prevention of the decline in cognitive performance that accompanies dietary and genetic deficiencies and aging." Other studies have shown an "alleviat[ion of] oxidative damage and cognitive decline" in mice after the administration of apple juice. Researchers at the Chinese University of Hong Kong discovered that fruit flies who were fed an apple extract lived 10 percent longer than other flies who were fed a normal diet. The History of Little Goody Two-Shoes is a little children's story published by John Newbery in London in 1765. The story popularized the phrase "goody two-shoes", often used to describe an excessively virtuous person.